Click picture to find us! The Guernsey Chess Club meets every Tuesday evening at 7:15pm at the Grange Lodge Hotel. Visitors are always welcome. Please feel free to contact one of the officers listed if you wish to find out more. For information about Guernsey and how to get here see Visit Guernsey site also see links to Guernsey sites. Cheap flights can be found with early reservation. Arita Strade won the quickplay buzzer tournament played on Tuesday 12 September 2017 at the Grange Lodge Hotel. The 42nd Intertrust Guernsey International Chess Festival was won by grandmaster Tiger Hillarp-Persson of Sweden (for a record 7th time). 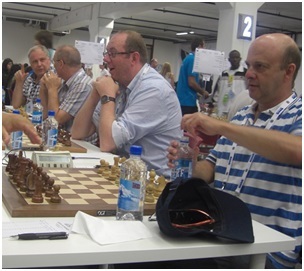 Grandmaster Jean-Pierre Le Roux of France came outright second. 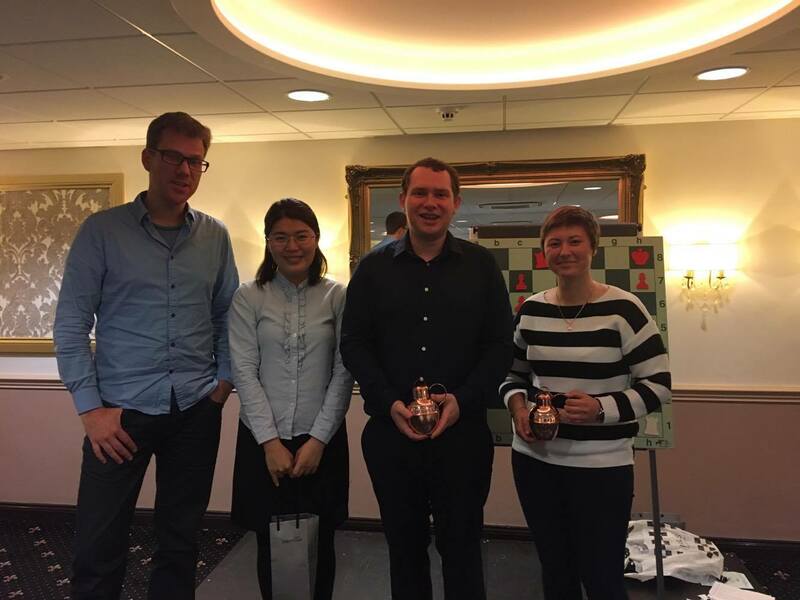 In the Holiday Tournament, Adry Goris-Schouwstra grabbed a share of the title alongside Wim van Hoek, as the week-long leader conceded a final round draw. 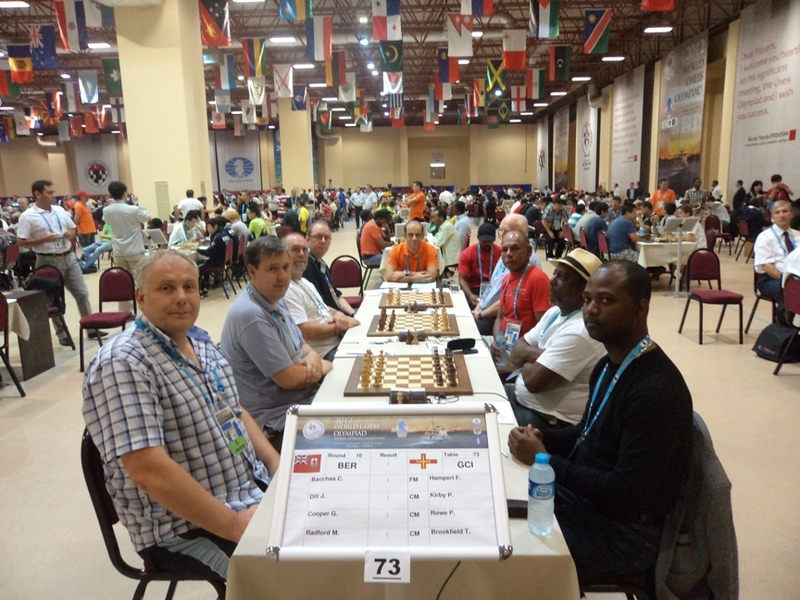 At the Baku Olympiad Guernsey finished 136th out of 170 countries taking part (180 listed but only 170 actually played) against seeding of 143rd. The team of Kirby, Rowe, Brookfield, Hale and Bateman all contributed to a total of 20.5 points achieving 3 match wins, 2 drawn matches and 6 losses. Rowe and Brookfield were joint top scorers with 5.5 out of 10 with Kirby close behind on 5 out of 9.Hale contributed 2.5 points and Bateman at his first Olympiad 2 chipped in with 2 wins. Highlights were the 4-0 victory over Lesotho and a hard fought 2-2 draw with Jersey. Guernsey narrowly lost the 79th Inter-Insular match in Jersey on Saturday 23 April 7.5 to 8.5. There were wins from Chris Holland, Graham Tyre, Jonathan Spicer and Oliver Rowe and draws from Peter Kirby, Toby Brookfield, Peter Rowe, Colin Goman, David Savident and Terry Harnden. Fred Hamperl retained the Channel Island champion honours for the 7th consecutive year. The reserves match was won by Guernsey with Philmore Pascua winning and Bogdan Nalichowski drawing. See results here! 79th Inter-Insular teams exchanged for Saturday 23 April match in Jersey. 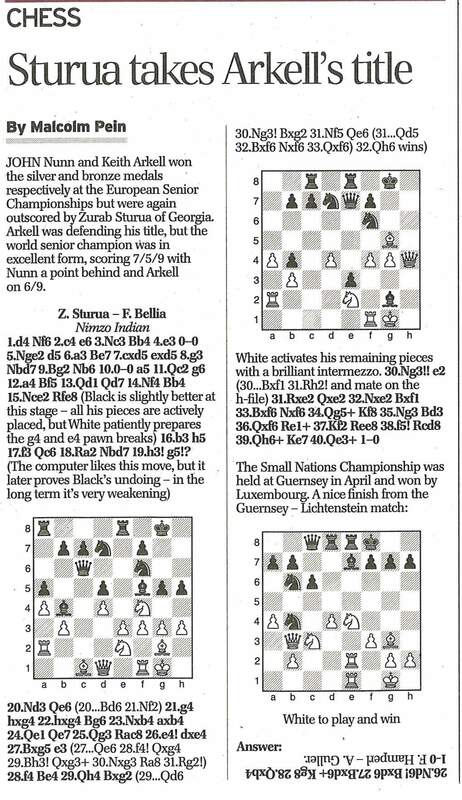 Fred Hamperl plays Louis Jouault on board 1 as champions from each island. 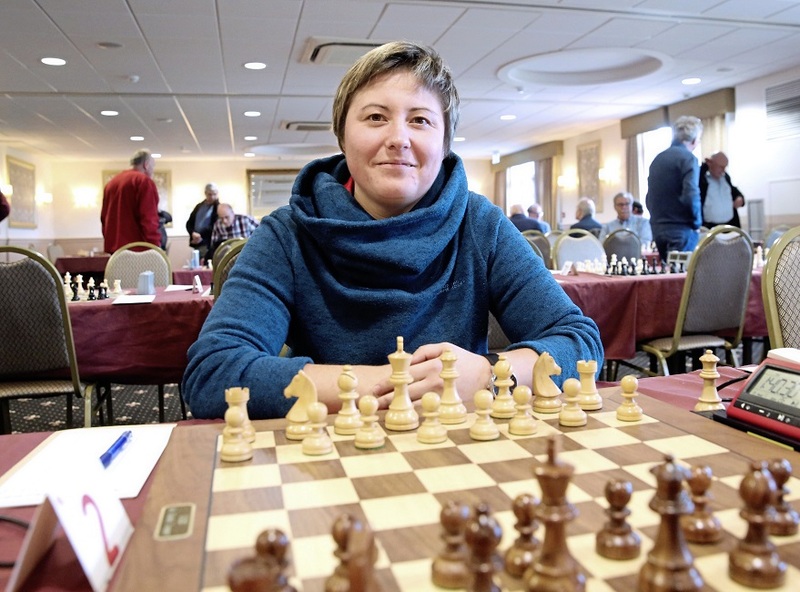 Arita Strade from Latvia living in Guernsey plays on board 6, David Savident faces Jersey's Philip Le Feuvre again! see Inter Insular pages for full line-up. 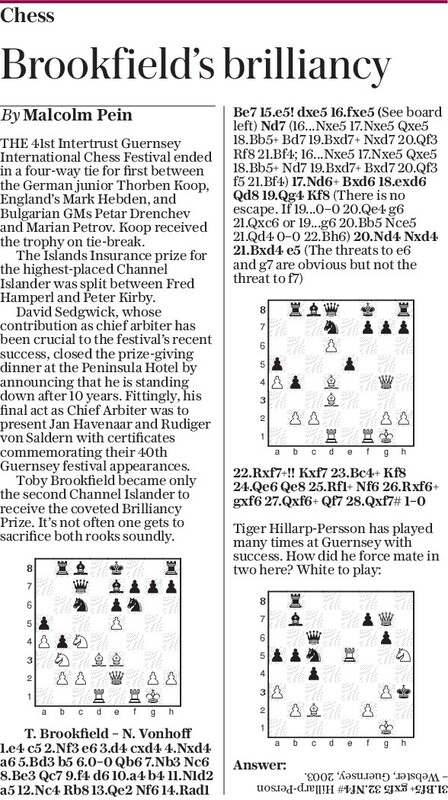 Guernsey's Toby Brookfield had his brilliancy published in the Daily Telegraph and the Guernsey Chess Festival was covered as well, see article Brookfield Brilliancy! The 42nd Guernsey International Chess Festival will be held on 16-22 October 2016 at the Peninsula Hotel, Guernsey. Blitz 22/9 and winter league starting 29/9 please contact Matt Kirk if you're interested. August 31st 2015 Guernsey will play Domloup chess club in the inaugural match of what we hope will become an annual fixture between our two clubs. Details for the event are progressing well and there may still be an opportunity to participate if you find that your calendar opens up. Contact Oliver Rowe if you may have an interest in playing what promises to be an enjoyable event. Jersey won the inter insular match on Saturday 30 May, 9 - 7. Fred Hamperl won on top board for Guernsey retaining the Channel Island Championship title for the 6th consecutive year a Channel Island all time record. October Festival Holiday Tournament will be FIDE rated! Fred Hamperl won the 2015 Championship. Peter Rowe leads championship after first cycle with 7 points, Andy Hale and Fred Hamperl are only half a point behind. Steve Naftel and Jon Bridel are promoted, with Terry Harnden and Matt Kirk relegated. Festival open games now available on festival pages. 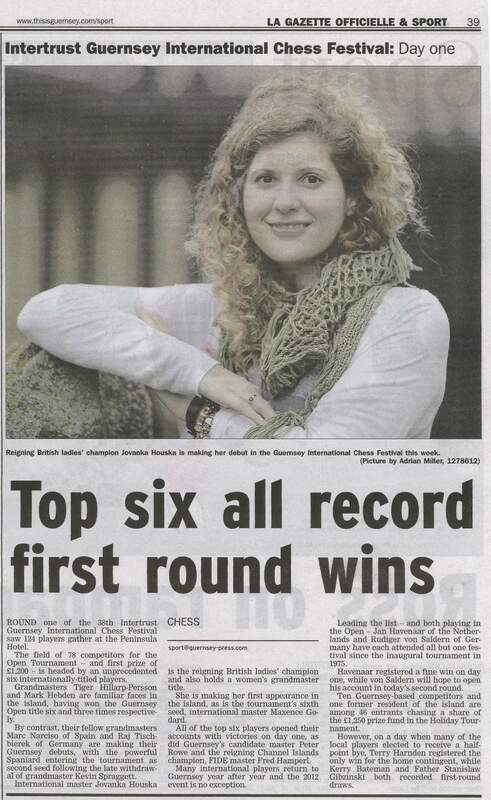 The 41st Guernsey International Chess Festival will be held on 18-24 October 2015 at the Peninsula Hotel, Guernsey. GM Eric Hansen from Canada won the 40th Guernsey International Chess Festival Open tournament! The Holiday Tournament Winner was Dennis O'Connell of Ireland. Ralph Hallerod from Sweden won the most brilliant game prize. Olympiad Tromso August 2014 - Guernsey team achieve all their goals and more! AGM is Tuesday 13 May at Grange Lodge 7.30pm. The 40th Guernsey International Chess Festival will be held on 19-25 October 2014 at the Peninsula Hotel, Guernsey. Winter League starts Tuesday 24 September, matrices now online! Fred Hamperl won the 2013 summer league and the 15 minute reapid play on Tuesday 17 September. AGM is Tuesday 14 May at Grange Lodge. Summer League is being organised by Toby Brookfield please let us know if you can play in it. Guernsey lost the 76th Inter Insular match 5.5 - 10.5 on Saturday 27 April at Les Cotils, but Fiona Naftel made sure everyone had a great time. Fred Hamperl drew with Black on the top board to retain the Channel Island championship trophy. Winter League starts on Tuesday 25 September - Grange Lodge 7.30 pm - Check new matrices to see who your opponent is. The Guernsey team have returned from the Istanbul Olympiad see results on Olympiad link. Photo: Board1: Fred Hamperl, Board2: Peter Kirby, Board3: Peter Rowe, Board4: Toby Brookfield (not in photo Reserve: Tim Knight). Guernsey won the 75th Inter Insular match 9 - 7 on Saturday 28 April at Hotel de Normandie in Jersey. 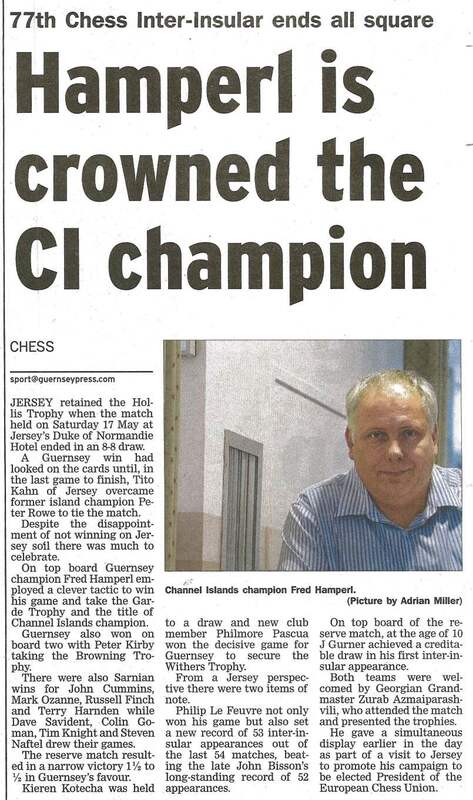 Fred Hamperl won with White on the top board to retain the Channel Island championship trophy. Team Captain Kerry Bateman was the last to finish his game and he sealed the victory for Guernsey with his win.